Tickets are now on sale for the 3rd Biennial Bate Bay Ball 2019. 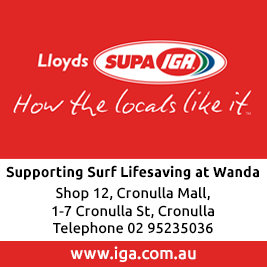 WANDA SLSC SPECIAL GENERAL MEETING Wanda SLSC's Special General Meeting will be held on Sunday 5 May 2019 to adopt the revised Constitution and Regulations. Venue: The Founders Room Time: 9:30am All Wanda SLSC financial members are invited to attend. TAE TRAINERS COURSE - MAY 2019 Course 1 dates Session 1 - Monday 29 April 6:30pm-9:30pm Session 2 - Wednesday 1 May 6:30pm-9:30pm Session 3 - Monday 6 May 6:30pm-9:30pm Session 4 - Wednesday 8 May 6:30pm-9:30pm Venue: Clovelly SLSC Registrations close: 29/3/19 Click here for course details. SILVER MEDALLION AQUATIC RESCUE AWARD - COURSE 1/SESSION 1 Course Dates Session 1 - Tuesday 14 May 2019 6:30pm-9:30pm Session 2 - Thursday 16 May 2019 6:30pm-9:30pm Session 3 - Saturday 18 May 2019 8:00am-4:00pm Venue: Coogee SLSC (downstairs room of Clubhouse) Registrations Close: Monday 15 April 2019 Click here for course details. SILVER MEDALLION AQUATIC RESCUE AWARD - COURSE 1/SESSION 2 Course Dates Session 1 - Tuesday 14 May 2019 6:30pm-9:30pm Session 2 - Thursday 16 May 2019 6:30pm-9:30pm Session 3 - Saturday 18 May 2019 8:00am-4:00pm Venue: Coogee SLSC (downstairs room of Clubhouse) Registrations Close: Monday 15 April 2019 Click here for course details. SILVER MEDALLION AQUATIC RESCUE AWARD - COURSE 1/SESSION 3 Course Dates Session 1 - Tuesday 14 May 2019 6:30pm-9:30pm Session 2 - Thursday 16 May 2019 6:30pm-9:30pm Session 3 - Saturday 18 May 2019 8:00am-4:00pm Venue: Coogee SLSC (downstairs room of Clubhouse) Registrations Close: Monday 15 April 2019 Click here for course details.